It’s not uncommon, in larger organisations particularly, for the senior leaders to write the strategic goals, then delegate the design of the KPIs for those goals to the strategy and performance people. And the result is a lot of wasted time for a set of KPIs no-one really owns. Firstly, the strategy and performance people weren’t part of the goal design conversation. They don’t always know the context of those goals. “Build the capability of our people” sounds quite familiar; most organisations have a strategic goal like this. But in an automotive sales company that has failed to attract and develop its workforce to meet even the basic role requirements, the context of such a goal is very different compared to a defence agency that must prepare its workforce to meet a new era of national security threats. Secondly, leaders are still using weasel words to write their goals. ‘Capability’ is a weasel word. Its definition is the ability or power to do something, but in business it’s used to mean any or all of ‘the right people with the right skills in the right place with the right resources doing the right things in the right way’. That’s what makes a word weasely: it has more than one meaning, and the intended meaning is hidden. Thirdly, leaders will challenge whatever the strategy and performance people come up with. The leaders aren’t part of the KPI design conversations. They don’t hear the struggle to understand and translate the goal, they don’t hear exploration of potential KPIs, they don’t hear the rationale for rejecting or accepting each KPI. So just as the strategy and performance people don’t understand the context and specific meaning of the strategic goals, their leaders won’t understand the rationale for the KPIs they take back to them. We can only own what we take our hand to creating. Solution 1: Include the strategy and performance people as ‘flies on the wall’ during the strategy design sessions. This way, they will have more understanding of the context and meaning of the goals. Solution 2: Leaders make themselves available throughout the KPI design process, to answer questions and provide more detail. Solution 3: Leaders write clearer goals and more description around the goals, to make them easier for others to understand. Solution 4: Leaders design their own strategic KPIs. Solution 3 should happen anyway, when you think about it. If the strategy and performance people can’t understand a goal, then how could the rest of the organisation possibly understand it? But for the purpose of designing great KPIs, hands-down, I prefer that last solution. 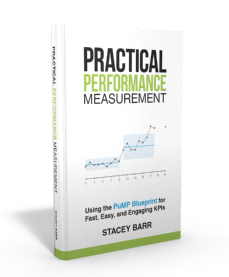 The only way I see KPIs come to life and create real performance improvements is when the owners of those KPIs were the ones who designed them. Our organisations need evidence-based leaders who are deeply committed to their strategic goals, who have a crystal clear vision of how those goals will become manifest in the real world, who can easily help others see that vision just as clearly, and who routinely monitor those goals and prove it as they become reality. 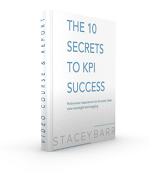 If you’re a leader, have you delegated the design of your KPIs to others? What happened? If you’re a strategy or performance professional, have you been delegated the design strategic KPIs? What happened?